A new natural health practice has sprouted up recently: oil pulling. This is the practice of swishing coconut oil around in your mouth for 10 to 20 minutes before spitting it out and brushing your teeth. There are so many anecdotal health claims that it can supposedly do, but is there any new research yet to back it up? What is coconut oil pulling about and how can it possibly be a remedy for all of these health problems? Basically, the practice involves swishing raw, organic coconut oil around in your mouth first thing in the morning after you wake up. It’s important to not drink anything or brush your teeth before you do this. Scoop out a small tablespoon of coconut oil out of the jar and take it directly into your mouth. Allow the oil to melt before trying to swish it around just as you would with mouthwash, but don’t gargle it. The taste may put you off at first if you are not used to it, but you will eventually grow an affinity for it and appreciate it. Now, try to swish it around gently in your mouth for 10-20 minutes and no longer. During this time, you can take a shower, make some tea, do some homework, clean up around the house before work, etc. Just make sure that you do not swallow the liquid because it can be full of trapped bacteria. You can also do oil pulling at the end of the day, but first thing in the morning may be most beneficial because your mouth is dirty from bacteria growing in your mouth overnight. This will let the oil kill all the bacteria before you swallow them. Some people claim that oil pulling can really transform your health. Since your mouth is basically a petri dish of billions of bacteria, fungi, viruses, and toxins, the oil can act as a cleanser of all the bad things before they have a chance to spread through your body. This takes a lot of stress off of the immune system and reduces inflammation. Teeth whitening. A celebrity that praises the benefits of oil pulling is Gwenyth Paltrow. Just look at her smile! Coconut oil is a natural antibiotic that can lift stains off of teeth and gums to make them brighter and shinier. When I tried oil pulling for one month, my teeth were incredibly pearly white and everybody gave me compliments. Cleans your mouth naturally. Coconut oil pulling is great at reducing and preventing tooth cavities as well as eliminating bad breath. Since it is a natural antibiotic, thrush and other overgrowths in your mouth will be controlled. This will prevent bad breath and cavities. Promotes clear skin. I’m not sure that this can be scientifically proven yet, but anecdotal evidence claims that coconut oil swishing will remove toxins in the body that lead to acne. It will clean the bloodstream around your face, so this may be why some people see clearer skin. It may also have something to do with cleansing the bacteria in your mouth. Gives you more energy. Since inflammation is being reduced in your body, your cells have more energy to do simpler things. This will translate into better physical performance, more motivation and a clearer head. Humans that lives thousands of years ago did not brush their teeth. So how didn’t their teeth rot out of their head? First of all, they didn’t consume sugar that destroys tooth enamel and second of all, they cleaned their teeth with natural means like oil pulling and chewing wooden sticks. Mummies have all their teeth for a reason, I guess. In the recent decades, there have only been a few studies on oil pulling that I could find. After searching for a little while, I could only find 7 scientific journals that tested the efficiency of oil pulling. Coconut oil pulling helps boost the immune system throughout the day. This will mean that your allergy symptoms will be less severe or eliminated. I have noticed that my allergies have been much better since I started oil pulling. I barely ever sneeze now. What is Coconut Oil Pulling About Scientifically? Oil pulling is not magic—there is a scientific basis around how it works. When you are swishing the coconut oil in your mouth, it mixes with saliva and creates a frothy liquid that gets pulled through your teeth repeatedly. Oil pulling with coconut oil seems to be the best—even better than sesame or sunflower oil. This is because it has a unique antibiotic factor that can kill pathogens in the mouth. Coconut oil also seems to be effective in reducing cavities. You can use a SMALL drop of tea tree oil to get rid of thrush and bad breath quickly. Peppermint may also be a great sensation in your mouth. My favorite oil to use is lemon, but be careful to not ingest certain essential oils because they can taste horrible and might not be edible. This is the perfect oil to use for oil pulling. It has such a pleasant taste that makes oil pulling enjoyable. Click the image for a discount! The gums always need a good scrubbing, too. 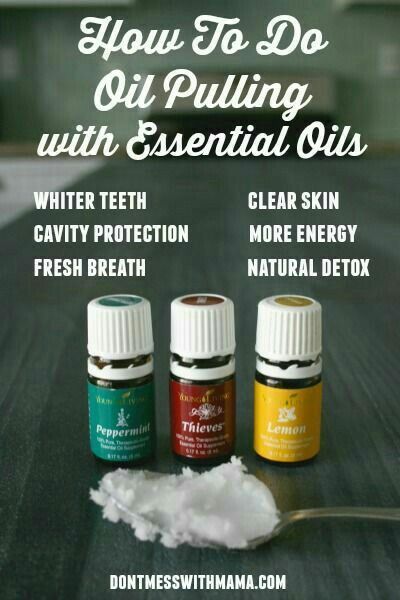 After doing this oil swishing technique for a few days, you will definitely notice that your breath is more fresh and teeth are a lot whiter. After about a week or two, your mouth will feel much more comfortable, as if there was reduced inflammation in your gums. I noticed much clearer skin and a more focused mood. I feel like oil pulling is a great workout for your jaw, too. There it no need for mouthwash at all when you oil pull. The oil freshens your breath wonderfully. I try to remember to do coconut oil pulling at least twice a week and I feel that it benefits me greatly. I would recommend that anybody try it for the potential oral health benefits as well as the possible anecdotal benefits because there don’t seem to be any side effects. Coconut oil also seems like a healthy alternative to mouthwash with alcohol or sodium fluoride. My favorite coconut oil is this one. For oiling pulling, you need to be sure that your oil is raw, organic and unrefined for maximum benefit. I love this jar of coconut oil because it has such a nice, sweet subtle taste that makes putting it in my mouth pleasant, rather than taste on the oily side like other brands of coconut oil. I am always here for you, so if you have any questions or have something to add about what is coconut oil pulling about, please leave me a comment!